As we all know WhatsApp is one of the most popular chat application for various mobile platforms today. Right now we only have option to use One WhatsApp on one smartphone for a single number. But now a days, many of us own a dual sim devices but still we can use only one Whatsapp for one number on one smartphone. But what if I say that you can use the chat messenger on both numbers separately on the same phone?? Yes, it is possible. You can have WhatsApp active on two mobile numbers separately on the same device. You can keep your personal and professional contacts separate through this. And it is very easy to use. This can be done through using a third party app called as OGWhatsApp which can be downloaded from our download center as well. 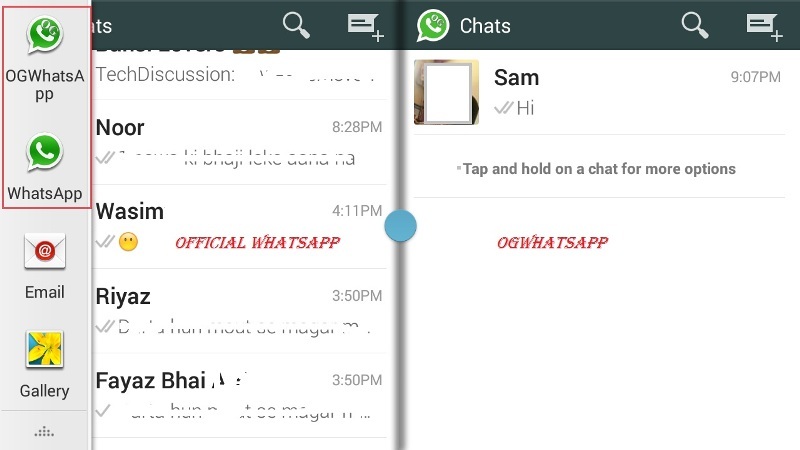 Here OGWhatsApp works as a separate app which does not affect the function of your existing WhatsApp. You don’t have to remove it or do any changes on the same. After adding the app you can use two numbers on the WhatsApp on a single device. It is possible to restore the backup data of WhatsApp on OGWhatsApp. You can select from different app icons and you can also copy the status of different contacts. The best thing about using OGWhatsApp is that you can just check all the images and videos in preview mode. It does not download and save in your gallery. You have to install MxPlayer in your phone if you are going to play online videos. And it has UI similar to WhatsApp. So let’s move ahead with the installation. There are two methods of adding this application. The first is the simplest one where you are playing with the OGWhatsApp folder which is situated in the memory card. While in the second one we are going to run the new number in OGWhatsApp. Lets checkout both the methods. Here you can use your old number on OGWhatsApp. And the new number on WhatsApp official application. For that first backup your existing messages. You can do that from WhatsApp directly. Backup the WhatsApp folder from SDcard/Whatsapp somewhere on safe place if you dont want to loose any of your messages or data. Download OGWhatsApp from here and install it on your phone. Then clear the WhatsApp data. The simplest way would be re-installing it back again. Now go in the SD card through file manager and rename WhatsApp folder to OGWhatsApp. Here you can now use the OGWhatsApp application to verify the old number and the official one for new number. Here we are going to use the new number on OGWhatsApp and your existing old number on the official WhatsApp. The process is quiet similar like above. Start with taking full message backup of your device. Then re-install WhatsApp so that its data is wiped out. Now using a file manager go in the SD Card and rename WhatsApp folder to OldWhatsApp. Just go ahead with verifying the new numbers here in the official WhatsApp application. Once done once again you have to clear the WhatsApp data. Now using a file manager again go in the SD Card and rename the official WhatsApp folder to OGWhatsApp and then the next thing you have to do is rename OldWhatsApp folder to WhatsApp. That’s it. You have to re-verify your old number on official WhatsApp and then the new one in OG Version.